Adding a custom domain to your blog is a great way to increase your brand identity. Setting one up, however, can sometimes be a frustrating experience, especially if you aren’t quite sure of the difference between an A-NAME and C-NAME record or where to find them. The good news is that the folks at Go Daddy created a handy tool that simplifies the process and makes it possible to redirect your blogspot domain to a custom Go Daddy domain with the click of a button. 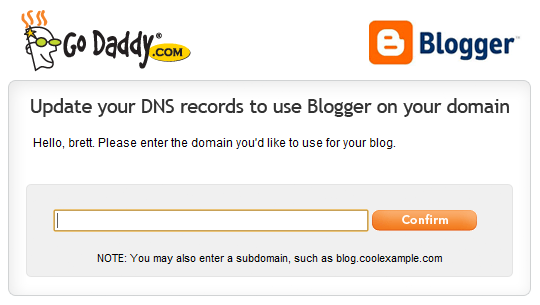 If you already own a Go Daddy domain and would like to connect it with your Blogger blog, head to the Go Daddy tool, log in to your Go Daddy account, enter your preferred domain or subdomain (for instance www.example.com or blog.example.com), click Confirm, and voila, your DNS records are updated. Once your DNS records are set correctly, log in to Blogger, click “Add a custom domain” in the Publishing section of the Settings page, follow the short instructions, and your custom domain will be set up and redirecting in 24 hours or less. If you purchased a domain from another provider, don’t worry, we’ve got a step-by-step guide that will walk you through the setup process. And finally, if you would like your blog to redirect to a custom domain, you can purchase one and get it set up without complicated configuration right from the Blogger dashboard in the Publishing section of the Settings page. , a new way for you to keep up-to-date with your interests and build relationships with the people who share them. 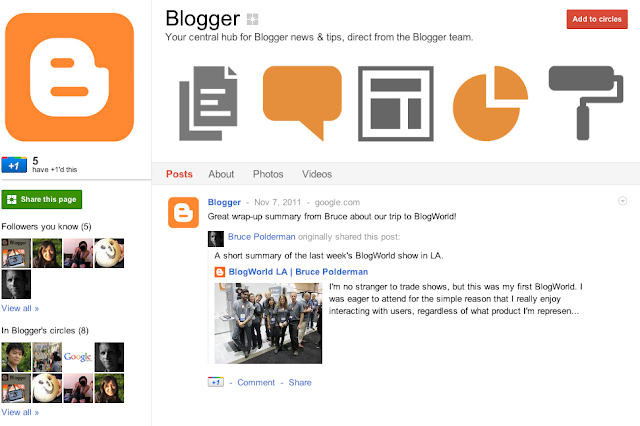 Today, the Blogger team is launching our own Google+ Page, and we’d like to invite you to add us to one of your circles. By adding Blogger's Page in one of your circles, you'll start seeing updates from the Blogger team in your Google+ stream. You’ll also have the opportunity to engage with other bloggers by writing comments on the posts. Lastly, be sure to mention +Blogger when you share your own tips -- if we come across something particularly helpful, we may reshare it. Earlier this week, the Google+ team launched Pages, a new way for you to keep up-to-date with your interests and build relationships with the people who share them. 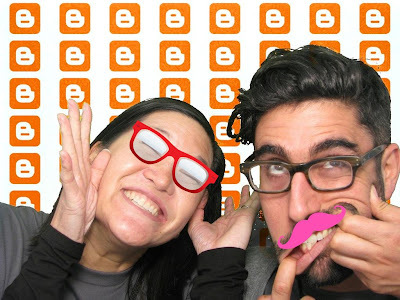 Today, the Blogger team is launching our own Google+ Page, and we’d like to invite you to add us to one of your circles. Many Bloggers put a lot of time and effort into creating a unique look for their blog, so today we’re excited to announce that custom templates are now available for mobile devices. 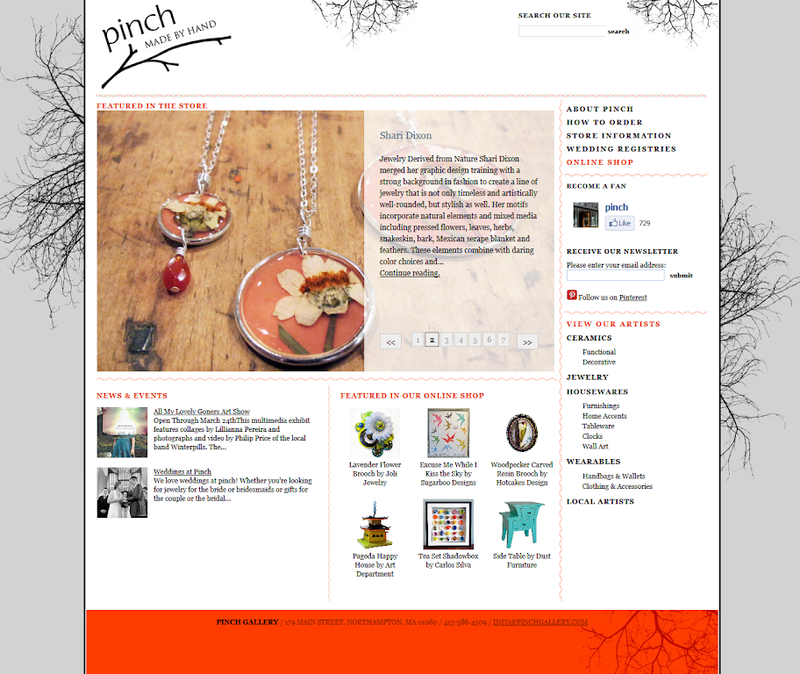 Side by side comparison of web and mobile experience. 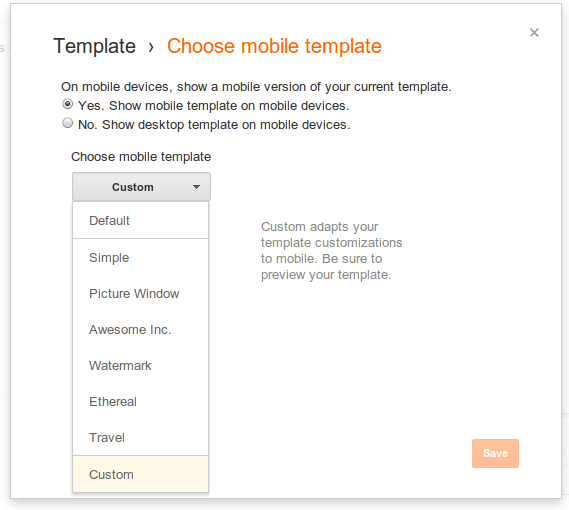 If you have a custom template for your blog and want it to appear on mobile browsers as well, visit the “Template” tab of your dashboard, click on the gear icon beneath the mobile template preview, and select “Custom” from the “Choose mobile template” pulldown. For more technical details and sample code, head over to the Blogger Developers Network blog. 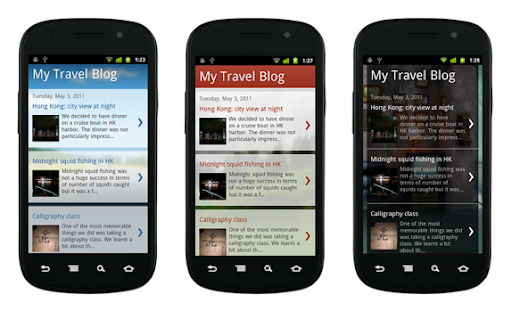 We hope you enjoy creating your own custom mobile templates and sharing them with your readers. less than a month ago, which is solid evidence that you’re as excited about this new technology as we are! As I mentioned in my last update, we’ve been working hard to respond to your feedback and quickly introduce enhancements. The ability to customize Dynamic Views has been a top request, so I’m pleased to announce that as of today, this is now possible. Using the Template Designer, you can now modify your background, fonts, or colors, and add a custom header image like we did on Blogger Buzz (just make sure it’s 65 pixels high). If you don’t fancy yourself a web designer, simply choose from one of the “suggested themes” that we provide. To begin personalizing your blog, log in to the Blogger dashboard, select “Template”, choose from one of the seven Dynamic Views, and then click “Customize” to access the Template Designer. Thanks again for all the terrific feedback on Dynamic Views. Over half a million blogs have selected Dynamic Views as their default template since they were introduced less than a month ago, which is solid evidence that you’re as excited about this new technology as we are! In fewer than 4 months since its launch, more than 40 million people have joined Google+, making it a living, breathing space for social connections and sharing to thrive. 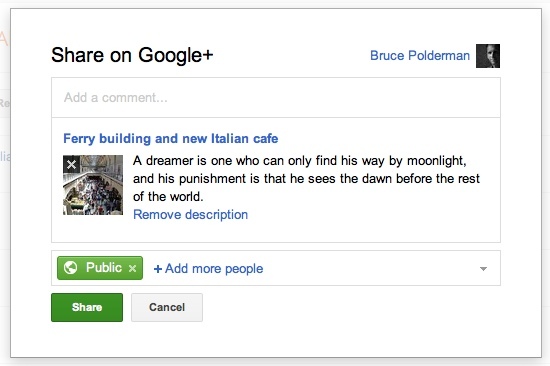 Today we’re excited to announce the first way you will be able to leverage Google+ -- by making it possible to replace your Blogger profile with your Google+ profile. Plus, bloggers who switch will automatically get access to the Google+ integrations we’ll be rolling out in the future. If you blog under a pseudonym and you don’t want to connect your common name with your blog, this integration may not work for you. That’s why we’ve made it completely optional to switch. This option is available for all users today in our testing ground, Blogger in Draft, and will be accessible from www.blogger.com in the coming weeks. 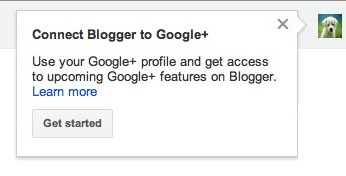 If you have a Google+ account and would like to replace your Blogger profile with your Google+ profile, log in to draft.blogger.com and click “Get started” on the promotion message, pictured below, or click here to get started right away. If you don’t have a Google+ account, you can create one here first, and then head back to draft.blogger.com and look for the promotion message. To learn more, check out our FAQs or visit our Help Forum. Happy blogging! that makes it easier for you to find what you need and focus on writing great blog posts. Since then, millions of you have opted to try it out, and we’ve received tens of thousands of feedback submissions. Based on that feedback we’ve fixed a number of bugs, including design updates, Safari compatibility for the iPad, and tweaks to scheduling posts. To help you get a better sense of what’s changed and how to navigate the new interface, check out the short video below. If you’d like to switch to the new look at any time, you can easily do so by clicking the “Try the updated Blogger interface” link at the top of your dashboard. Back in August, we announced a completely new, streamlined blogging experience that makes it easier for you to find what you need and focus on writing great blog posts. Adding Google Analytics to your blog will give you more insight into where your visitors are coming from and help you determine which content they engage with the most. It's an easy to use, powerful, free product that is used internationally by businesses large & small. If you already have a Google Analytics account, simply navigate to your blog’s Settings > Other tab and enter your blog's Google Analytics Web Property ID. Blogger will then insert Google Analytics code into your blog automatically, regardless of which template you're using, including mobile. For more details and troubleshooting tips, check out this post on the Blogger Developers Network blog. Google Analytics is supported on blogs using Dynamic Views, Layouts templates, and mobile templates, but not Classic templates. Because of the technical differences in how Blogger’s stats and Google Analytics collect data, you are likely to see some minor discrepancies between the two. Having a solid understanding of the traffic and visitor engagement statistics of your blog is one of the best ways to help it grow, and that’s why today we’re excited to announce that you can now easily connect your Google Analytics account with your blog. , by default a few weeks ago, we heard from a number of Bloggers who preferred to use their own, previously installed Lightbox solution, or who simply wanted to continue blogging without the new feature. Thanks to your feedback, we turned Lightbox off temporarily, and we’re re-launching it today with the option to disable it, along with a handful of fixes to bugs that you reported. To learn more about Lightbox and how it works, check out the original blog post. If you’d like to disable Lightbox on your blog, log in to Blogger and select “No” next to Lightbox in the Settings | Posts and Comments section (new interface) or the Settings | Formatting section (old interface). Thanks again for your detailed suggestions, and please continue to share your feedback in our help forum. When we enabled a brand new photo viewing experience, called Lightbox, by default a few weeks ago, we heard from a number of Bloggers who preferred to use their own, previously installed Lightbox solution, or who simply wanted to continue blogging without the new feature. in an effort to make it easier for readers to enjoy and discover your posts. You responded. 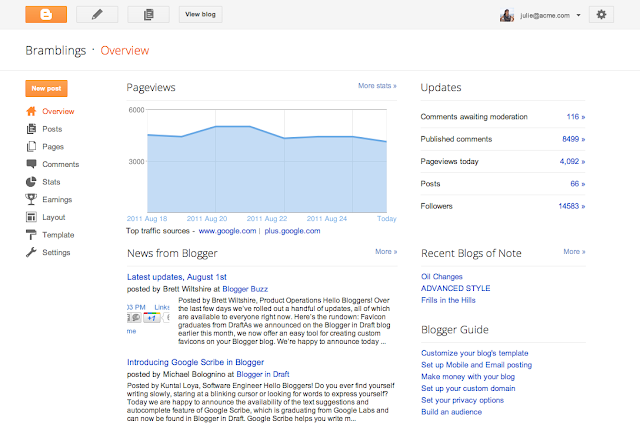 As of today, hundreds of thousands of blogs have changed their blog template to Dynamic Views. The clear favorite appears to be Magazine, with Classic running a close second. Our plan is to continue to introduce updates and improvements as quickly as we can. Thanks again for your feedback, and we’re happy to hear that you’re enjoying Dynamic Views! Last week, we launched Dynamic Views in an effort to make it easier for readers to enjoy and discover your posts. You responded. 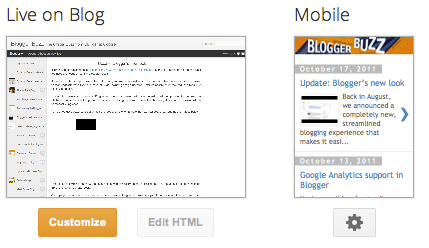 As of today, hundreds of thousands of blogs have changed their blog template to Dynamic Views. The clear favorite appears to be Magazine, with Classic running a close second. when we launched a completely rebuilt, streamlined authoring and editing experience, we’re in the process of bringing you a much improved and modernized Blogger. 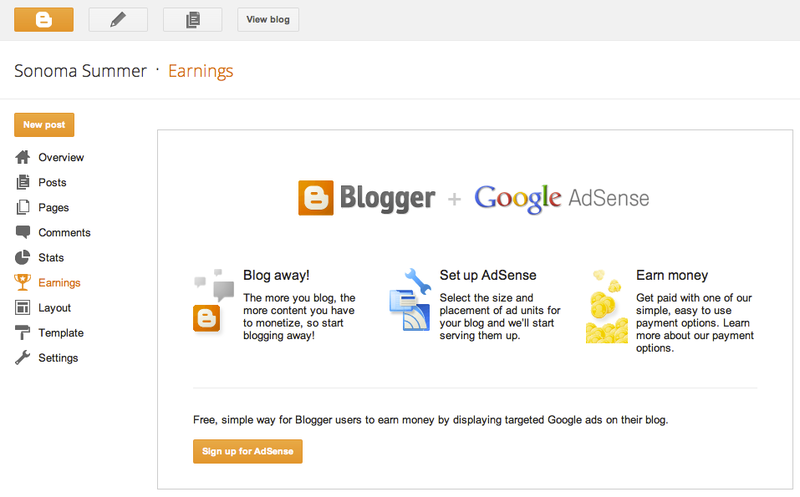 The next phase of these updates starts today with seven new ways to display your blog, called Dynamic Views. Dynamic Views is much more than just new templates. With just a couple clicks, you’ll get infinite scrolling (say goodbye to the “Older posts” link), images that load as you browse, integrated search, sorting by date, label and author, lightbox-style posts for easy viewing, keyboard shortcuts for quickly flipping through posts, and one-click sharing to Google+ and other social sites on every post. No two blogs are the same, so you can choose from seven different views that display text and photos differently. 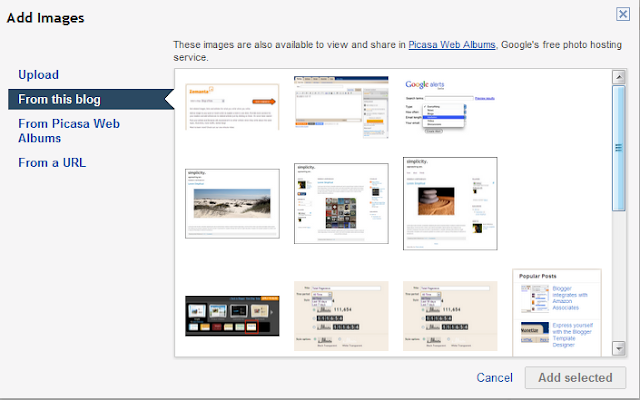 For example, if you have lots of photos on your blog, you may prefer Flipcard or Snapshot. If your blog is more text-heavy, then Classic, Sidebar (what you’re seeing now on Blogger Buzz) or Timeslide may be preferable. Here’s a quick description of each of the new views, along with links to some of our favorite blogs where you can check each of them out in action. 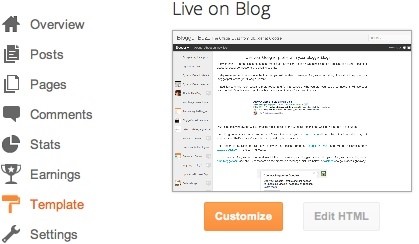 Enter the name of your favorite Blogger blog below and click Preview to check it out with Dynamic Views. 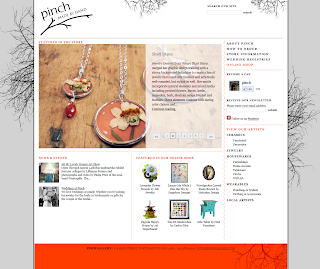 Adding a Dynamic View to your blog is as easy as changing your template. Log in to Blogger, click on the Template tab on your dashboard, and select whichever view you want to set as your default. Note that readers can still choose to navigate your blog in a different view by selecting from the pulldown in the upper left of the screen. If you want to add your own touch to any of these new views, you can upload a header image and customize the background colors. We’ll be adding more ways to customize Dynamic Views in the coming weeks. We hope you enjoy the latest update to Blogger, and that, as always, you tell us what you think by completing this short survey. Note: In addition to Blogger Buzz, several other official Google blogs will be featuring Dynamic Views through the weeks and months ahead, including the Gmail Blog, Google Voice Blog, and Docs Blog. We’re excited to bring Dynamic Views into the fold and we'll be looking at how to incorporate this new technology across Google’s blog network in the long term. Update: Dynamic Views are now customizable! Add a custom header, change the background, colors, fonts, and more.
. After she was Noted, Rebecca received many new followers and emails asking her about her tips for blogging, so she’s graciously written up this blog post for anyone looking for tips on how to get started. Hi everyone! 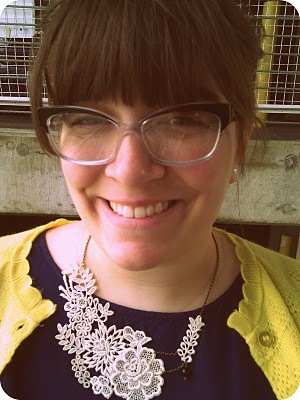 I'm Rebecca Brown, a blogger and personal stylist in the Seattle area. When I started my blog nearly 2 years ago, it was to document my attempt to wear a different dress for every day of December (sounds super interesting, right? It proves you can write a blog about anything). There are so many great resources out there for bloggers looking to hone their craft. Here are a few of my favorites: - 10 Things About Your Blog That Drive Me Crazy (via B at Beautifully Invisible) - Don't Be A Savage Blogger (Jamillah via Beautifully Invisible): - Build a Better Blog (via Vahni at Grit and Glamour). I hope these tips are helpful! Blogging has been such a great part of my life - allowing me to express myself, build a community and make lifelong friends. And the great thing about it is that nearly anyone can do it. So have fun with it, don’t take yourself too seriously, and you’ll be a great blogger in no time! Editor’s Note: Rebecca is one of the bloggers we’ve featured on Blogs of Note. After she was Noted, Rebecca received many new followers and emails asking her about her tips for blogging, so she’s graciously written up this blog post for anyone looking for tips on how to get started. Introducing Lightbox, the latest in a series of Blogger updates aimed at giving you an improved and modernized blogging experience. 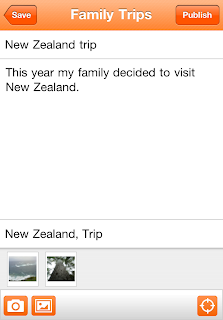 Lightbox is a whole new way to interact with photos. When clicked, images now expand into a shiny new overlay that displays them at their full size for optimal viewing. Once an image is opened in the lightbox view, any other images from the same post will now appear as thumbnails along the bottom, which can be easily browsed by clicking the arrow keys on the left or right side of the lightbox. If you’ve custom-coded your image HTML so that images function as hyperlinks, then the lightbox view will not display and your original image hyperlink will work as expected. Your images never looked so good! We've published an incident report on Blogger Status. Update (5/15 10:55PM PST): Blogger should be back to normal for the vast majority of people affected by this issue -- if posts are still missing, please check your drafts (you may need to republish). We are in the process of restoring comments made during the affected period from 7:37am PDT on 5/11 to 1:30pm PDT on 5/12. If you still have other issues, please contact us via the temporary form we’ve set up for this particular issue. Thanks again for bearing with us, we’re deeply sorry for the inconvenience we caused. We’ll share an incident report later this week. Update (5/31 7:45PM PST): We've published an incident report on Blogger Status. 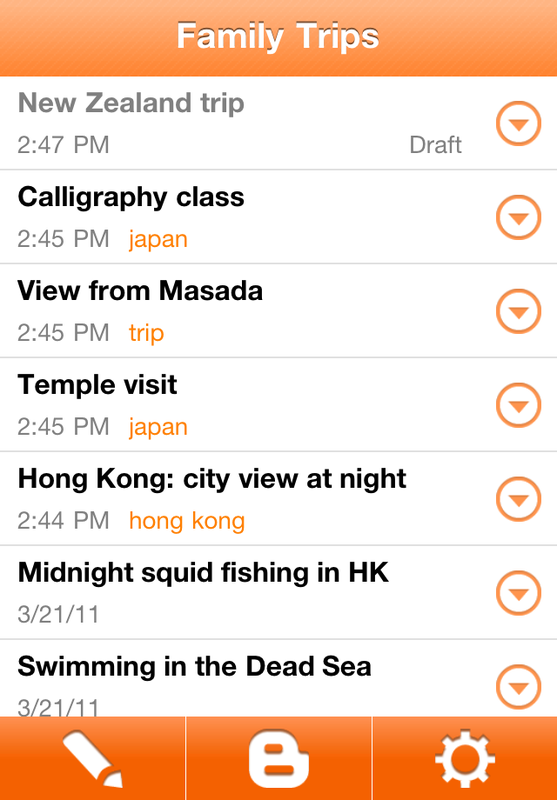 Geotagging has been available for a while on Blogger in Draft, but is now available to all users with today’s release. 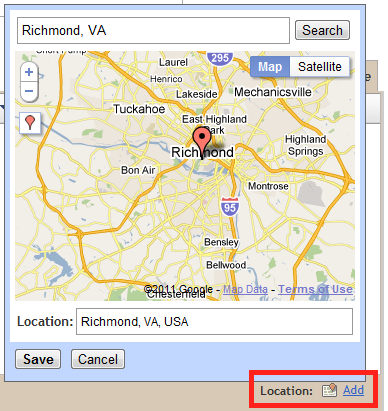 To add location information to your blog posts, simply click the Add Location button in the bottom right of the new post editor. This will bring up a new window that displays the familiar Google Maps interface and you can search, drag, zoom, and drop markers for the location of your choice. We’ve made a few small updates and bug fixes since the original Draft release, most notably the ability to remove location information after publishing and the addition of a placemarker for pinpointing location info. 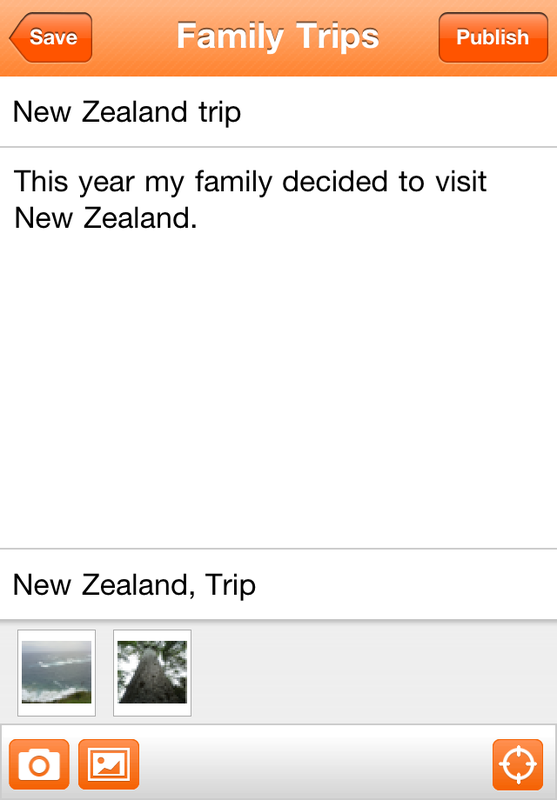 Clicking the “photo” or “video” upload buttons will now display a sleeker, updated picker. 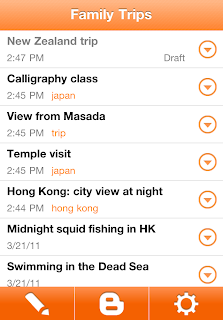 We’ve also made it draggable so you can look back at the post editor if you need to. Users posting comments from non-Google accounts should no longer see the intermittent bX errors that occurred last week. The intermittent errors which were preventing the browsing of archives via Newer / Older navigation links has been fixed. There was a time early on in Blogger’s life where we had our own, custom account system for handling login authentication. Starting in 2006 all new Blogger accounts were created using the official Google accounts system, and then in 2007 we started the process of moving all of our legacy users over to the Google accounts system. Now, four years later, we’re finally at the home stretch of the transition. For a number of technical and operational reasons, we’ve decided to finally end our support for migrating legacy accounts and blogs after May 30th, 2012. So if you have a Blogger account and haven’t logged in since 2007, you will lose access to the account and associated content permanently unless you update to the Google Account system before May 30th, 2012. Updating to the new account system is easy and should take just a few minutes. We really do value all of the content that has been created on Blogger and we hope that as many people as possible will reclaim their blogs. If you’ve been avoiding this task for a while, we encourage you to head over to the Legacy migration page and update your account. We’ll be sending a similar notice later this week via email to all of the email addresses associated with the legacy accounts we have in our database. In a few weeks we’ll also make another announcement here on Buzz, with more specific updates on the transition. If you have any other questions about this process, please let us know by posting your issue in the Login section of our Help Forum.